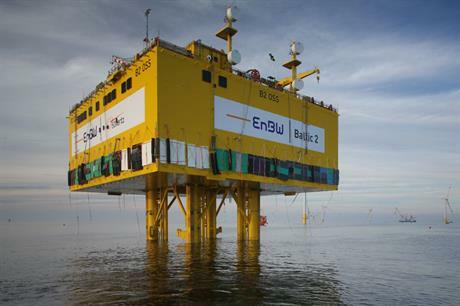 GERMANY: The substation for the 288MW Baltic 2 offshore project has been successfully installed, developer EnBW has announced. The 4,400 ton platform was positioned and connected yesterday at the site, which is located 32 kilometers from the German coast in the Baltic Sea. EnBW's platform was originally towed from the port of Kiel on 16 September but installation was delayed due to adverse weather. A consortium of Alstom Grid and WeserWind were contracted to design and build the substation. Installation of the project's 80 Siemens 3.6MW turbines began in August and is expected to be completed by the end of this year. Baltic 2 will be EnBW's second offshore wind farm, following on from the nearby 48MW Baltic 1 project, which it brought online in 2011.